”Hardscaping” is a term that is often used to describe any part of a home or commercial landscape that is paved or man-made. For example, Rockford hardscaping projects we’ve worked on in the past range from driveways to patios to pillars and columns. 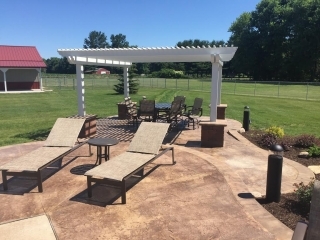 Creative Concrete and Landscaping is proud to be able to provide a full range of both landscaping and hardscaping services to our clients in Rockford, IL and other areas. Because we offer expert service in both hardscaping and landscaping, we can help you to create a complete and integrated design for your entire outdoor living space. We have extensive experience in creating Rockford hardscaping projects of all sizes, using a variety of materials. Our specialty is concrete, but we also work with brick pavers, tile, natural stone, and wood. No matter what look you want to achieve for your Rockford hardscaping, or what design you have in mind, we can work with you to create a beautiful new addition to your home or commercial landscape.